Valentine’s Day – Did You See That One? 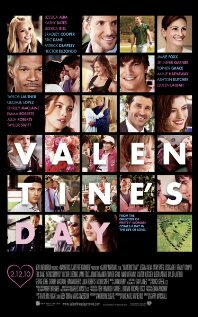 Director Garry Marshall put together an all-star cast for this romantic comedy released in 2010. Marshall is best known for films about romance like Pretty Woman and Runaway Bride. The ensemble cast is impressive and includes talent from all segments of pop culture. The film was panned by the critics but managed to remain successful at the box office becoming the third most successful February release. The film is also linked to Marshall’s newest release New Year’s Eve. This is a fun film filled with the clichés you might expect from a romantic comedy. The script seems to avoid taking risks and instead falls back on the expected conclusions throughout the film. I would stop short of calling the movie predictable since it does hold several surprises. If you’re expecting a film with some hidden gem or new styling you’ll be disappointed. The film is relatively straight forward in all aspects and makes itself easy to watch. The acting is good and the characters are well-written. The movie is just an entertaining story with some funny moments and a good message. I give this film 3.3 out of 5 stars. Garry Marshall and Valentines Day are the very reason why I will not touch New Year’s Eve (though from what I hear it is actually much worse). I’m not a fan of Marshall but I don’t avoid him either. I’ll see New Year’s Eve eventually. Pingback: The Double | Did You See That One? Pingback: Total Recall | Did You See That One? Pingback: Notting Hill | Did You See That One? Pingback: Jobs | Did You See That One? Pingback: Chicago | Did You See That One? Pingback: New York, I Love You | Did You See That One? Pingback: The Other Sister | Did You See That One?